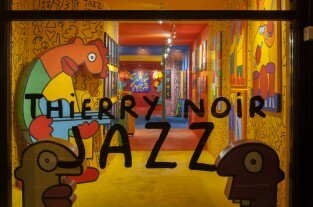 Thierry Noir moved to West Berlin from his home Lyon in January 1982 with a suitcase and no idea what he wanted to do. Back then, when the city was divided in two, West Berlin was an island – surrounded on all sides by Soviet-occupied territory – but despite its predicament, or perhaps in spite of it, West Berlin became a haven for the world’s avant-garde, hosting heavy hitters like David Bowie, Iggy Pop and Nick Cave, all during the Soviet years. 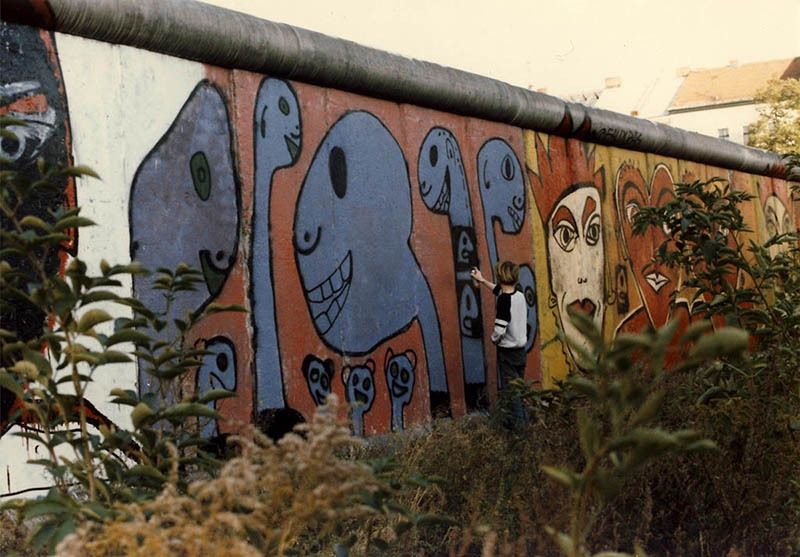 Now, 25 years after the wall fell, Thierry is celebrating the anniversary by undertaking a large-scale commission at the German Embassy in London as part of an exhibition East meets West: Bringing down the Wall. We caught up with Thierry to find out more. 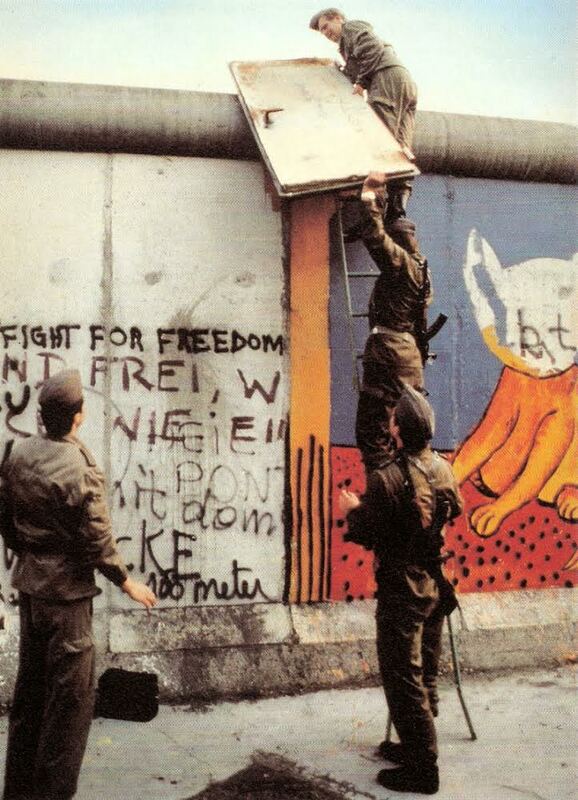 What does the anniversary of the fall of the wall mean to you? It’s great. I lived very close to the Berlin Wall for many years, looking to the other side, in the direction of East Berlin. And now I paint the former GDR embassy, 25 or 30 years after. It’s very bizarre. But it’s great. Berlin has changed very much in 25 years. Especially the nature. There were two walls with about 50 metres of death strip in between, and all this area is now full of trees. And those trees are 25 years old so they are quite big and there are new streets with new names. Everything has changed very much. It’s a completely new city compared to West Berlin, which was kind of an international village. Now Berlin is the capital of new Germany. The culture is very strong. 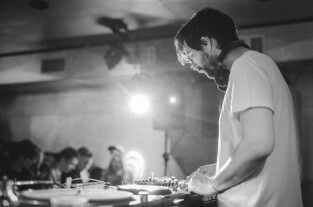 Ever since the West Berlin underground scene in the ’80s, the culture has been very strong. I think the attraction of Berlin, because it’s quite cheap compared to Paris or London, is that you can make happen what you have dreamed of somewhere else. 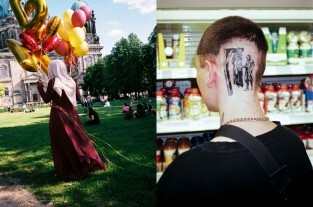 That’s why a lot of young people are in Berlin now and it makes the culture very strong. There are a lot of young people who are very active, especially in the eastern part of Berlin, in Friedrichshain, and sometimes I collaborate with them. It’s great to collaborate with people who are 20 or 30 years younger than you. It keeps you young. The last collaboration I made was with an English artist called Dave The Chimp, who’s based in Berlin. 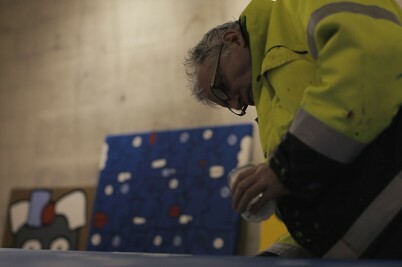 And I also recently collaborated with another artist from Australia called Dscreet, who came to Berlin to make a show. It’s been very interesting. 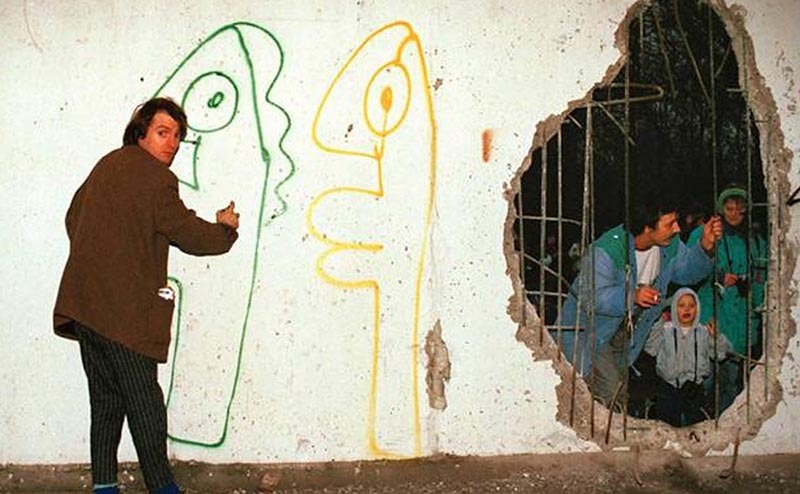 Do you think the wall encouraged people to be creative and resist? The wall is gone now, for 25 years, so we’ve turned the page on that I think. It’s a new generation, who don’t know the wall except from books or videos, but I think what’s continued is that wall paintings are now on the street as street art. That continues to be strong. Was it dangerous to paint the wall? Yeah it was illegal to paint the wall. The wall was not a border. 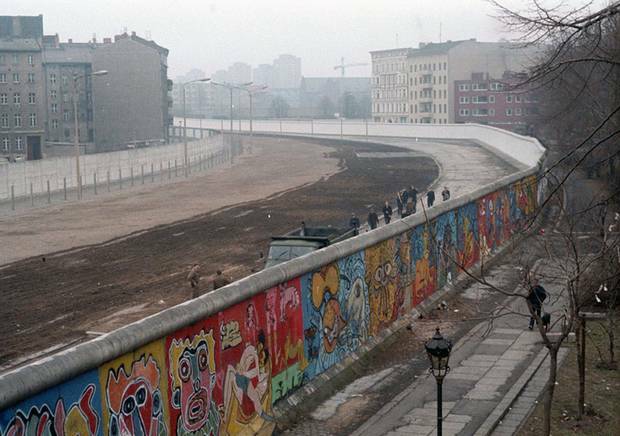 Both sides of the wall were East Berlin. The real border was five metres before the wall. So the soldiers were allowed to jump over and arrest me if they wanted to. But I was young and quick at that time so they had no chance against me. Did they ever try to arrest you? Yeah a couple of times but they were quite slow because they had to take the ladder from the Eastern part to the Western part and it took quite a long time. So I was quick enough to go and get all my equipment before they came. In certain parts of Berlin, like Checkpoint Charlie, it was more dangerous because that part of the wall was very well guarded. Did you ever meet any people who crossed the border from East to West? No I never saw anybody who tried to cross the wall. It was almost impossible at that time, in 1982. Especially in the centre of Berlin, it was very well guarded. Inside the two walls there were alarms and guards on watchtowers – it was almost impossible to cross the wall between West and East Berlin. Probably it was better to cross far away from the centre in the countryside. Why does the story of the wall continue to fascinate the world? The fall of the wall is the symbol of the new freedom in Europe – especially the painted pieces that are all over the world now. They are there to tell the new generation, ‘Do not repeat the mistakes of your parents.’ Many people alive now were not even born when the wall was there, so it’s difficult for them to understand. But when you look at a piece of the wall and then you realise that the wall was not an art project but a death machine, it’s probably easier to understand what it’s all about. 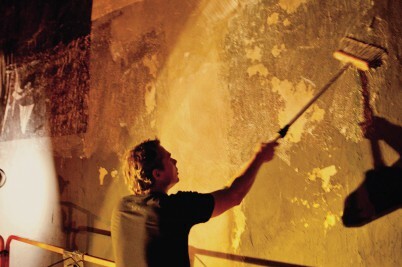 Do you want to share the story of Berlin through your art? Yeah, last month I was in Los Angeles and I saw a piece of the Berlin Wall I have painted in the hills over Hollywood! Near Mullholland Drive, in the plain sunshine. That was really amazing. So we stopped the car and we ran in the direction that we’d seen it. That was really a great moment. Do you hope people who see your work will begin to think differently about other borders in the world? Yes, it’s quite difficult to explain the Berlin Wall in Los Angeles because it’s really far away. But you can make the comparison with Tijuana, and the border between Mexico and California. And you can explain that that wall will also disappear at some point, like the Berlin Wall, because these walls do not exist forever. So this art is now for all the people who come from Mexico and south of Mexico, who are fighting for this. That wall has to go. But it’s very complicated with politics, the border between Mexico and the US is a border between rich and poor. Do you believe that all borders are temporary borders? Yes and the changes are quicker and quicker now. People want to have changes in the world, and now with the internet the world is much quicker, and changes are coming much quicker too. Compared to 100 years ago, it’s a completely new planet. 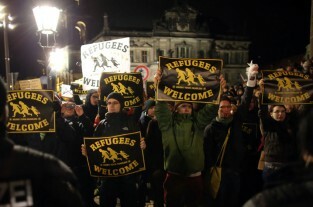 Does the free Europe that people imagined when the wall fell exist today? You have to fight for this freedom to keep it. It’s not given forever. A war can happen from one day to the next. So we have to keep fighting for freedom and it’s not easy. Thierry’s new work for East meets West: Bringing down the Wall at the German Embassy in London will be on public view during an open day, November 12, 9am-9pm. A place to realise a dream? T.moeski doesn’t like to talk... which is odd, considering he's a master in the world of his own language: filmmaker, photographer, surfer and artist. 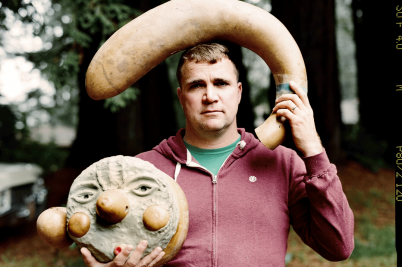 Huck heads to California to peek around his whimsical world. 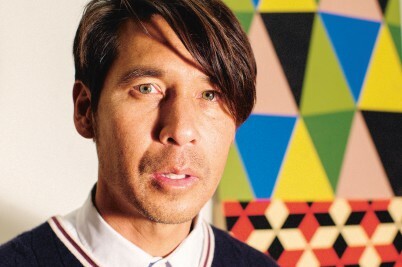 He may have lived through criticism, court cases and commercial success, but the skate punk-turned-street art entrepreneur is now ready to back his own campaign.